ABSTRACT: We investigated benthic foraminifera in the eastern equatorial Pacific Ocean at the Integrated OceanDrilling Program Site U1334 (~3580 to 3650m paleo-depth) during a time interval of ~33.2–31.9Ma, which is characterized by paleoceanographic changes after the “overshoot” associated with the Antarctic glaciation across the Eocene-Oligocene transition. Correlation between MDS axis 1 (faunal composition of benthic foraminifera) and the fragmentation rate of planktonic foraminifera was positive. MDS axis 1 was also positively correlatedwith the d13C values of benthic foraminifera at Site 1218. The positive correlation between the benthic foraminiferal d13C values at Site 1218 and the fragmentation rate at Site U1334 did not correspond to the general relationship between the benthic foraminiferal d13C values and carbonate corrosivity. Transient common occurrence and subsequent gradual decrease of Astrononion echnolsi, a characteristic species of MDS axis 1 that appeared to expand temporarily from the Southern Ocean to the abyssal Pacific, occurred abundantly during ~33.2–31.9Ma. 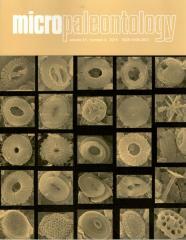 The similarities among MDS axis 1, the fragmentation rate and the benthic foraminiferal d13C values were likely explained by the heterogeneity in carbonate corrosivity changes, associated with different extent of export production in the Southern Ocean compared to other oceans after the Oi-1 Antarctic glaciation. Such heterogeneity might result from the transient expansion of the Southern Ocean deep water into the abyssal Pacific during the earliest Oligocene.